Gabriella and Darron thought their magickal battle was over when they defeated the evil warlock, Richard. When her Aunt Donna seeks Gabriella's help in rescuing her catatonic daughter from the Dark Coven, Gabriella discovers that her cousin holds a power within her that would be catastrophic in the hands of the evil witches. Gabriella's coven sets out on a journey that may be their last. Along the way, they meet new allies, face devastating treachery, and battle not only the Dark Coven, but the darkness within themselves. When Gabriella finally comes face to face with the cousin she never knew existed, her true destiny is unveiled, and the fate of the mortal world is in her hands. BUY: Amazon, Smashwords and Barnes & Noble. After collecting the offering from his followers, the leader returned to the center of the circle and the waiting initiate. With one quick motion, he sliced open his own palm. He held his hand over the cup, letting his blood drip slowly into the chalice, until the wound miraculously healed before Darron's startled eyes. When the chalice was full, he carried it to the eager initiate who took the cup firmly into his hands and tilted it towards his lips. "As this blood makes you one with our flesh, so your soul follows to become one with the darkness," the English voice intoned. "Rise Darron," the leader commanded. And as he spoke, he lifted the hood from his head. Rise brother of the Dark Coven." 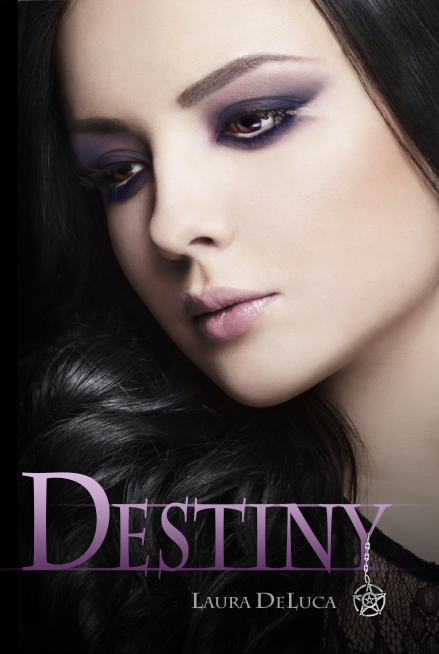 Destiny Buy Links: Amazon, Smashwords and Barnes & Noble. What an excellent series! I loved this. It was so well written that I felt as if I was on this journey with them. Book 1 really sets you up for this second book. You learn so much and it continues on with the story. Very enjoyable!